With the launch of WhatsApp Business App businesses now have access to an official whatsapp number with the ability to showcase globally a description of the business, website, store location; smart messaging capabilities like greetings, away messages, quick replies and reporting stats for messages sent, delivered and read. Whatsapp business a seperate app built with the small business owner in mind was launched by Whatsapp in the first quarter of 2018 and currently available on Android only. Nonetheless WABetinfo claims work on IOS has already started. AccraFlorist becomes GlobalFlorist and will need more than the current WhatsApp business app. An enterprise engagement model will now be the ideal option for GlobalFlorist. For a wholesome enterprise engagement, a programmatic access through whatsapp API’s to build chatbots and provide a base for support systems within the whatsapp ecosystem. However this was not mentioned in the launch of the Whatsapp business App. Making Whatsapp developer API’s or Whatsapp business APK available for companies like Rancard who have built AI bot enabled management portals (R2MP), which will enable bigger companies and enterprises to engage their many customers in a seamless way by offering an omni channel solution. 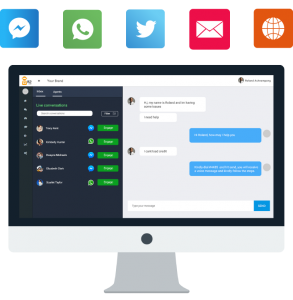 R2MP refers to Rancard’s R2 AI enabled engagement platform with omni-channel – multi-language, AI enabled dialogue chat bot capabilities.In essence, live/human agents who typically delivers customer engagement function is augmented by an artificial agent or bot through channels such as whatsApp, email, web, skype, twitter and messenger for now. GlobalFlorist is able to manage whatsapp customers via their call centre with a bot that escalates to the agent accessible portal. A typical user experience for GlobalFlorist would be – a flower order is made by a customer of GlobalFlorsit, an integration to Whatsapp enterprise solution will allow R2MP to follow through and update the user on the stage a delivery is and send a confirmation message through WhatsApp automatically. With the bot capability, automated notifications from Whatsapp can be sent to users anytime with no human intervention. Customers will receive their message through the company’s verified whatsapp profile. In the case where there are connectivity issues, or the user is not available on a particular channel an available alternate channel will be used to further notify the customer e.g. through SMS and or the other available channels. This solution includes realtime reporting, management of agent, bot response accuracy, bot to agent escalations, pending issues, multiple whatsapp numbers etc.